Today's buyers have options for home financing in Idaho through traditional banks and lenders. There are many lenders in Rexburg and Idaho Falls. One type of lender is often overlooked. The owner of the property. When the seller of a home extends credit to the buyer, it is called owner contract financing. 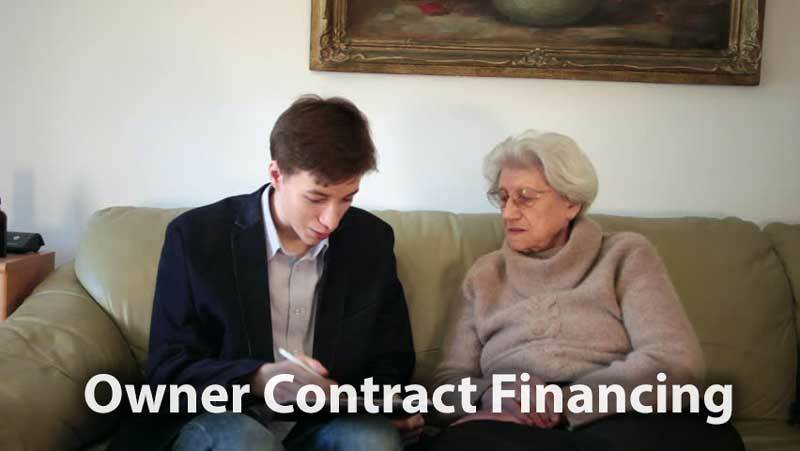 In the image above, a grandmother moving to a retirement home, is signing a contract to sell her home to her grandson with a note that he will pay on. The grandmother is acting as the lender. This is one form of owner contract financing. An owner contract is a financing agreement between the buyer and the property's owner. Under the terms of this financing agreement, the owner becomes the lender, allowing the buyer to forego working with a bank. The buyer agrees to purchase the property and repay the owner as outlined in the contract. This is also called owner carry-back financing, and it can be a flexible option for buyers who cannot or do not want to work with a traditional bank to finance their real estate purchase. Buyers and sellers in Rexburg may wish to consider owner contract financing for a number of reasons. If the agreement is well written, it can provide several benefits. First, the buyer benefits because the financing requires no loan origination fees. Buyers have the option to negotiate a rate that is more favorable than what is offered through the banks. Buyers may also be able to avoid private mortgage insurance, even with a lower down payment, and avoid other fees common with lender financing. The buyer isn't the only one who benefits. Sellers enjoy a larger pool of potential buyers when they can offer financing. The owner contract agreement also provides the property owner with steady residual income. The agreement typically brings a 10 to 20 percent down payment as well, and this can give the seller some cash for a move or other immediate expenses. If owner contract financing were a perfect financing option, everyone would be using it. Both buyers and sellers face risk with this financing option, and they need to understand it. First, both buyers and sellers need to understand that this type of financing is a legally binding contract. This means they need to fully understand what they are agreeing to do and what the consequences are should they breach the contract. Working with a real estate attorney can help buyers and sellers in Rexburg avoid costly mistakes while creating the contract. Often the owner contract will include a balloon payment, typically set 5 to 10 years down the road. If you are the buyer, you need to know what this payment is and what happens if you cannot make it. Both owners and sellers need a way to track payments. It's best to have a formal process using a neutral third party to collect and record payments. This will eliminate problems and questions between the parties. Finally, sellers need secure the loan with the property they are selling. All buyers need to fill out a loan application, and sellers need to run the necessary background information and credit checks. This protects sellers from lending to someone who is presenting themselves differently than they truly are. If you are buying or selling real estate in Rexburg and are considering an owner contract financing arrangement, be certain you get the right guidance from a real estate lawyer. This will help ensure you are making a wise, financially sound decision for your real estate transaction.